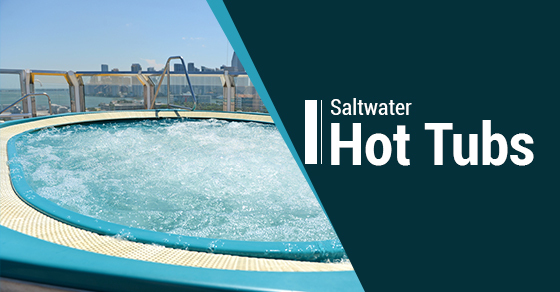 What is a Saltwater Hot Tub? A saltwater hot tub is a hot tub that uses specialized salt instead of chlorine or bromine pucks to help regulate the chemical balance of the water. Less salty even than tears, most people are not able to taste it and notice only the soft and luxurious feeling of their skin after a relaxing soak in the warm saltwater. When choosing the best system for maintaining your hot tub, it is important to have all the information you can about each method. Here are the answers to some of the most frequently asked questions about saltwater hot tubs to help you decide if this method is right for your family. Is it the same salt I cook with? In many households, people typically use and cook with what is known as “table salt.” This type of salt is actually sodium chloride, a chemical compound made with additives to address a variety of health concerns. Hot tub salt is sodium bromide, a combination of sodium and bromine instead of chlorine. This is because bromine is more effective and more stable at hot temperatures than chlorine. Both are effective sanitizers for water but bromine is more effective over a wider range of pH levels at the hot temperatures common to a spa. Will I still need chlorine or bromine pucks? After making the switch to a saltwater hot tub, you will no longer need to bother with that annoying floater full of chlorine or bromine pucks. The bromine generator inside the hot tub will turn the bromine salt into pure bromine, sterilizing the water. As bather load varies constantly, you may still need to shock your hot tub occasionally in order to maintain ideal water chemistry. Won’t salt cause my tub to rust? For the vast majority of hot tubs, the answer to this question is ‘no’ for several reasons. First, like table salt, bromine is not corrosive. Second, there are no metals in hot tubs which come into direct contact with the water. There may be the occasional exception to this rule, but these metal pieces will be made of stainless steel which does not rust. Hot tubs are generally made of an acrylic shell with PVC or vinyl plumbing, materials which will not be corroded by salt. In addition, the salt is very mild, so you won’t have to worry about it leaving stains on your hot tub cover, either. Why should I switch to saltwater? There are many reasons to switch to saltwater, but perhaps the most convincing ones are the health and environmental benefits. Saltwater tubs are healthier for you because they are always producing bromine, even when not in use. This means that the water is always clean and sanitary. It will not cause the same skin reactions that many people have in response to chlorine or bromine pucks as those reactions are usually due to the bonders, fillers and glues rather than the chemicals themselves. Saltwater tubs are also better for the environment for two reasons: First, you are using less water by not having to empty and refill your tub as often. Most hot tubs must be changed 4-6 times per year, but saltwater tubs can often be changed as little as once per year thanks to the lack of unnecessary additives building up in the water. Secondly, because you are emptying and refilling your tub less frequently, you are also using less energy heating it.